Basketball Courts come in different shapes and sizes. A standard size Basketball Court is 94' x 50'. 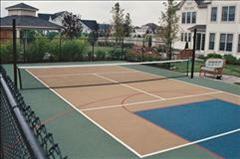 Century Tennis can install a Basketball Court on your Tennis Court or simply by itself. We carry a full line of Basketball systems from Bison & Goalsetter.